Update: One Mile At A Time has reported that the statement was lost in translation and this flight route won’t happen. Read the lowdown here. 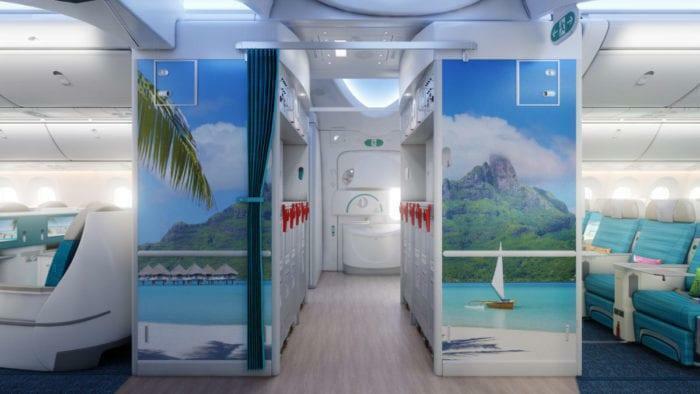 Singapore Airlines should be on the lookout as Air Tahiti Nui looks to steal the crown. The carrier would look to operate direct flights between Paris and Tahiti with their new B787s. The flight is long enough that if it went ahead, it would become the world’s longest flight at 9,765 mi over 20 hours. Currently, the flight makes a stop in Los Angeles. Currently, the title of the world’s longest flight is held by Singapore Airlines, operating an 18h 40m flight from Singapore to New York’s Newark Airport. The route between Singapore and New York is 8,290 nm as the crow flies and is operated using an A350ULR aircraft. By launching this flight, Air Tahiti Nui would be flying the 9,765 mi route non-stop. Currently, Air Tahiti Nui operates a daily flight to Los Angeles. Twice a week, the flight operated by the Polynesian carrier continues on to Paris. These flights to Paris are currently operated using one of the Airline’s older A340 aircraft. Air Tahiti Nui is halfway through receiving 4 B787 aircraft which it has ordered from Boeing. The first of these was delivered in October, going on to make its first flight for the airline in November. Now two of four have been delivered, and it is expected that the final two B787s will be delivered by September 2019. Air Tahiti Nui would also be competing on the route itself. While they already operate flights between Tahiti and Paris with a stop in Los Angeles, they’re not alone. Recently, a new low-cost long-haul carrier called French Bee has also begun to serve the same route, however, moving the stopover to San Francisco. Like Air Tahiti Nui, their flight operates twice a week. The new B787s ordered by Air Tahiti Nui are not your stock B787s. While the exterior of the aircraft sports and elaborate blue design, it is inside where things get interesting. The first thing passengers notice are the brightly coloured seats. The usual dull grey bulkheads are instead replaced with colourful ocean scenes. 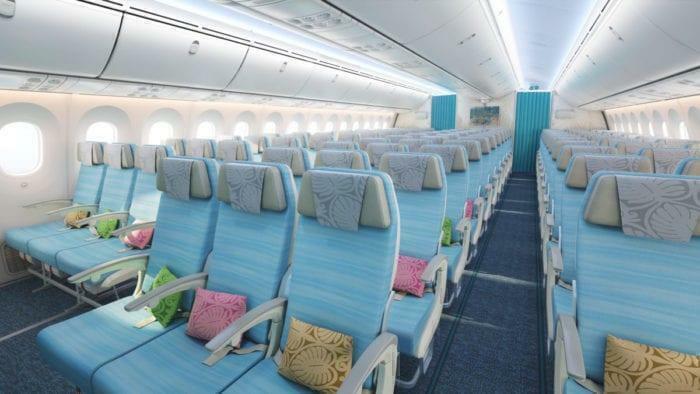 Air Tahiti has put quite a bit of thought into passenger comfort. However, Simple Flying doesn’t believe that it would necessarily be the most comfortable for a 20-hour flight. In business class despite introducing lie-flat beds, Air Tahiti Nui still expects window passengers to forgo direct aisle access. We won’t even go into our thoughts of 20 hours in economy! 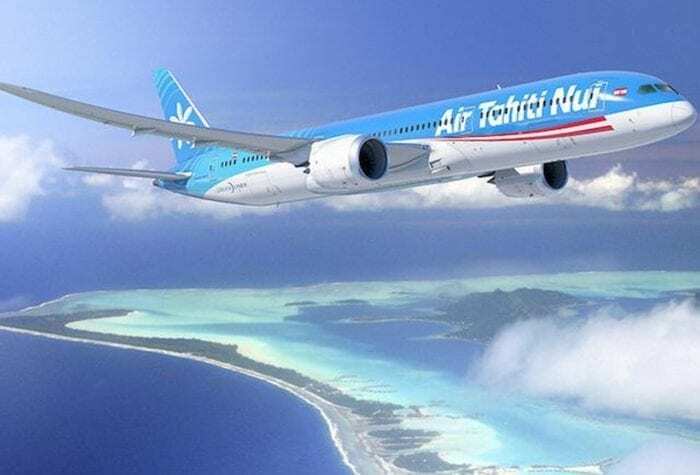 Air Tahiti Nui clearly has passenger demand for flights between Tahiti and Paris, but will this transfer to non-stop flights. Currently LAX is a midpoint where passengers can get off the aircraft and stretch their legs, maybe even grab a coffee. This breaks up the flight into two effectively. Without the stop, passengers will be confined to their chair for the majority of the 20 odd hour flight. While this doesn’t necessarily affect those looking to get from A-B as quickly as possible, it may not prove that popular with passengers. Do you think direct flights from Tahiti to Paris would be a success? Let us know in the comments down below! I wonder if anyone knows the passenger load which could be carried on such a long flight, or whether the fuel tanks are large enough. The A350ULR traded about 80 passengers for its ultra long range capability, but had to modify the fuel system to carry enough fuel. It would be strange to have to re-configure the new 787’s while they are still almost brand new. It is crazy that they claim this was a traduction error. They knew what they were suggesting, they just spoke without pulling out a calculator. well Stop over to LAX it’s healthy, but with a A350 LR yes… it could be perfect! Regarding Boeing 787not really affordable and technicaly expensive for the carrier.